i've enjoyed my last two years with rapha condor sharp (now rapha condor jlt). the improvement in my abilities has been in gradual decline, but since that was the point from the outset, i think it a success for both parties. it's a little known or admitted detail that at the end of the 2009 season, the uci introduced a regulation applying to continental classified teams, requiring the recruitment of riders who would contest what is frequently referred to as the lanterne rouge. along with the uci's intent to globalise the sport of road-cycling, they apparently also wished to make the professional sport more all-encompassing, opening up team membership even to those without a natural talent or innate ability to race with the front runners. the reasoning seems to have involved some convoluted sense of fair play, one that allowed me to be signed by john herety to make up the grupetto at each race i entered, even if i was a grupetto of one. i think i acquitted myself well. part of the conditions attached to the regulation concerned the non-appearance of the nominated riders in the published results, but strictly ahead of the time cut-off. though my early outings in black, white and pink were characterised by the race crew dismantling the podium and a distinct lack of spectators. by the end of season one, i and my fellow grupettists were becoming well used to it. the conundrum is contained in the knowledge that the only acceptable improvement was a drop in performance. my pride in the latter was greatly enhanced as a member of last year's rapha condor team. they had quite notably changed tack for 2012, recruiting an impressive number of young and inexperienced riders who, i hope, learned nothing at all from yours truly. you'll note that not once was i mentioned in the subsequent book by tom southam and camille mcmillan; 'inside out'. in fact, while these youngsters were still settling in to the reality of pain and suffering, stretching every muscle fibre and sinew in an attempt to impress mr herety, i was still several kilometres behind with nary a view of the team skoda's rear window. even more impressively i'd warrant, other than on the start line, i never saw hide nor hair of the king of scotland during last year's scottish road race championships. in fact, i didn't get the opportunity to congratulate him till the following monday. every black team kit, however, has a sky blue lining. as of 2013, the same regulation now applies to pro-continental and world tour teams, meaning a need for recruitment in the upper echelons of the sport. 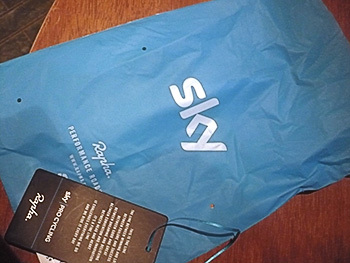 having acquitted myself well over the preceding two years, the new partnership between team sky and rapha obviously had fringe benefits, with a recommendation from mr herety to sir dave. 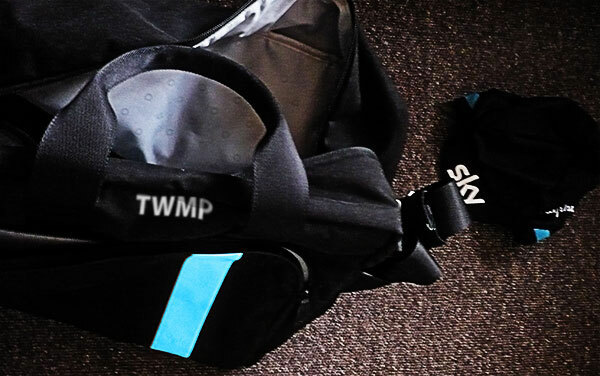 to place all in present day context, i am now an official member of team sky, with a mandate to fulfil similar duties on a more international and salubrious stage. 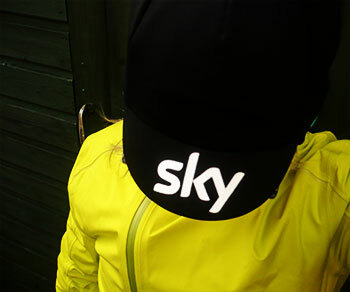 you'll have heard by now that sky have distributed their numbers into two distinct streams; the one that will ride the major tours, and those who will ride the classics. i believe i have been included in the latter division, but with the possibility of racing either the giro or the tour. i tend to favour the former option, for the route is so hilly this year, that i shouldn't have to try too hard to be nowhere near the front. perhaps the only perceivable disadvantage is that i'm unlikely ever to see myself in one of scott mitchell's team sky web galleries. you will also be aware, no doubt, that apart from the team that contested the tour down under, the remainder spent a good couple of weeks at a training camp in mallorca, an excursion i had hoped/expected to join. however, despite many unreturned calls to sir dave, my airline tickets failed to arrive. a short e-mail pointed out that actual training might irreversibly affect my natural ability for finishing well towards the back. any likelihood of my achieving a recorded position could seriously affect the team's relationship with the uci. they obviously do not wish to endanger that number one ranking. the disappointment of having to face a scottish winter rather than a group hug in mallorca, was somewhat tempered by the much vaunted and anticipated receipt of up to 780 pieces of new rapha kit tidied into two monogrammed cases. i had a phone call from that nice mr hemmings at rapha, informing me that he would be driving the majority of kit over to mallorca in a van, so he'd arrange for my own selection to be dispatched independently. a couple of days later, a message from the harbourmaster at kennacraig ferry terminal mentioned they had a nicely marked bag for my attention. you can almost tangibly feel the excited anticipation with which that call was met. 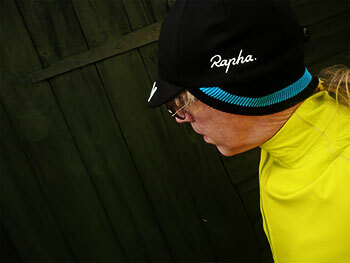 now, i'm not one to complain (well, not much), and i can sympathise with rapha's concern over the weather conditions in which i am required to ride, but a race bag containing only a sky monikered winter hat (lovely though it is) did not quite live up to my heightened expectations. a quick phone call to mr hemmings brought to light the discovery that much of my promised apparel had been delayed due to a typing error in the name on the jackets' and jersey side panels. having checked the spelling on my e-mail from sir dave, i think i can see the history behind that one. 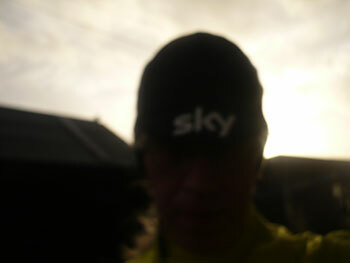 however, i cannot deny that the cap has elicited many laudable responses from those i have met when out on my training rides, though if i have to re-set one more sky hd box, i'm going to scream. and to be perfectly honest, how do i know why their broadband's not working? in the sub-zero windchill, the elasticated ear covers have kept me warm and cosy, while the peak has not only tempered a low, watery sun, it has seen greater use alleviating a substantial dripping of water onto my tinted eye coverings. i have no doubt as to the quality of the kit that will eventually head my way. i believe my first outing at the back of the race will be on 23rd february at omloop het nosebleed, so there's plenty of time to correct the spelling on my jerseys and send them onto the calmac ferry terminal. when all turns up, i'll let you know what it's like, because whatever sir bradley and mr froome tell you will be conditioned by the fact that they are one heck of a lot faster than the rest of us. surely a different world? i'm sure i need not remind you that i'm a lot nearer your own level of competitive tardiness. i wonder if i get a sky dish as part of the deal?